Many people think that you can tell a horse's age by its teeth. This isn't quite true. Horse's teeth aren't like athe rings of a tree that show each year's growth. Telling a horse's age by its teeth is not 100% accurate, but it will give you an approximate range if you don't know the horse's actual date of birth. The younger the horse, the closer the teeth will match its real age. As horses age, a number of factors can affect the condition of the teeth and make it more difficult to estimate age. Things like basic maintenance, diet, grazing conditions, vices and genetics all play a role in how the horse's teeth themselves are aging. Foals get their first milk or deciduous teeth shortly after birth. The final milk teeth are grown in by the time the foal is about nine months old. The first permanent teeth begin to grow in when the horse is between two and three years old. It's not unusual for a horse owner to find a shed tooth in a feeder or on the ground. The milk teeth are shed gradually, and all of the permanent teeth are grown in by around age five. Milk teeth are paler in color and shorter than permanent teeth. The new permanent teeth are quite concave on their surfaces and these 'cups' along with the angle, shape and a groove on the outer vertical surface that gradually grows out, called Galyvane's groove, are the indicators of how old a horse might be. As the horse wears its teeth by grazing, the concave surfaces are worn flatter. By the time a horse is about eleven years old, it will have worn its teeth flat. How quickly this happens depends on the type of grazing it has available. Horses that graze grass on sandy ground will wear their teeth flatter than those fed only hay grown on clay type soil. At about age ten, the Galvayne's groove begins to appear at the gum line. This groove will continue to grow out so that reaches the entire length of the tooth. By about age fifteen, the groove will reach half-way down the tooth. By the time a horse is in its mid-twenties the Galvayne's grove begins to disappear from the gum line, and if the horse lives long enough will disappear completely as the tooth naturally wears away. As the horse ages, the angle of the teeth increases. The milk teeth are short and straight as are the newly erupted permanent teeth but as the horse ages, the teeth become more angled. This is where the saying 'long in the tooth' comes from, because as the angle increases, so does that length from the gum line to chewing surface. The teeth also change in shape from oval to more angular as the horse ages. The color of the teeth will probably be quite yellowed and stained. At some point after their late twenties, a horse may start losing teeth. Horse's teeth don't really grow for their whole lives but have a lifespan of their own. A domestic horse may actually outlive the lifespan of its teeth. As the horse loses more teeth, its health may suffer. It may be less able to chew tougher hays and grasses and require a diet tailored for older horses. Some horses may grow wolf teeth and tushes or canines. These are extra teeth that grow in the toothless bar of the horse's mouth between the front teeth and back. Sometimes these teeth may have to be removed if they interfere with the bit or cause discomfort for the horse. These teeth usually come in by the time the horse is five years of age. Some horses will not have them at all, or for some, they may not be a problem. 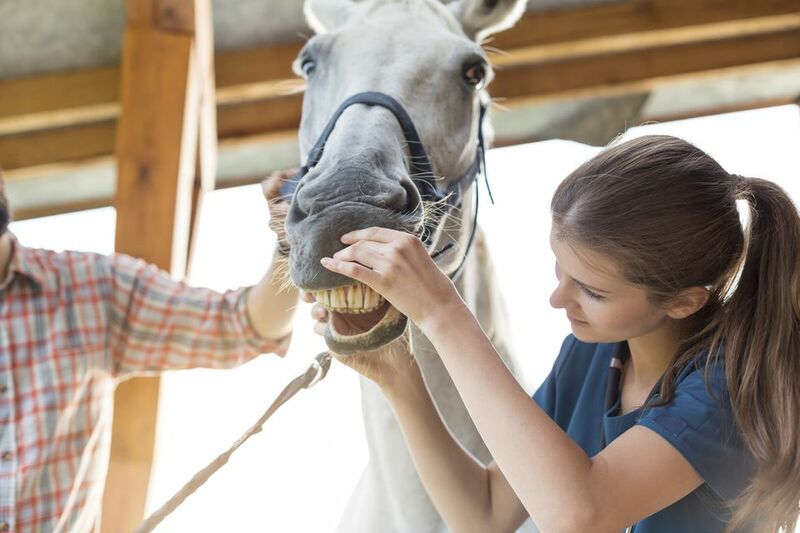 Because horse's teeth grow throughout most of their lifespan and may not wear evenly, your horse will need to be checked by a veterinarian or equine dentist about once per year. Your horse may need to be floated, removing any sharp edges or hooks that will prevent him from chewing properly and holding a bit or wearing a hackamore comfortably. While this is a general description of aging horses by their teeth several university agricultural extensions have detailed fact sheets with diagrams that show horse's teeth at every stage of life. The PDF file from the University of Nevada Cooperative Extension is quite good and easy to print out so you can take it to the barn and compare pictures to actual teeth. The University of Missouri has a similar online resource with diagrams and explanations. Horse Terms -- What Is a Livery?